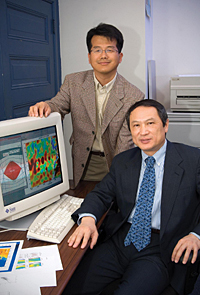 Xiao-Hai Yan (seated), Mary A. S. Lighthipe Professor of Marine Studies at the University of Delaware, and postdoctoral researcher Young-Heon Jo have detected deep-ocean whirlpools called "Meddies" using a new satellite-based technique they developed with researchers at NASA and the Ocean University of China. 2 p.m., March 20, 2006--Move over, Superman, with your X-ray vision. Marine scientists have now figured out a way to "see through" the ocean's surface and detect what's below, with the help of satellites in space. 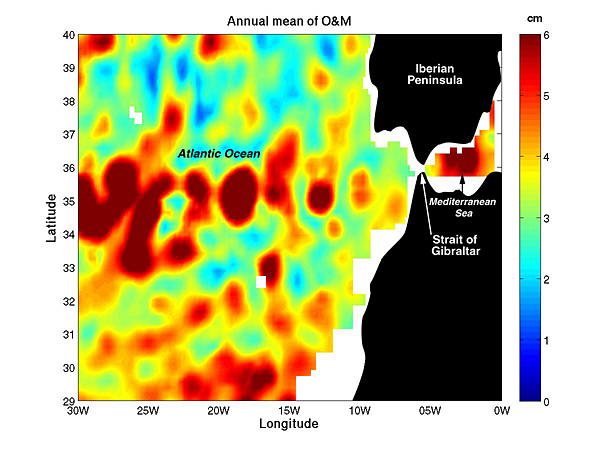 Using sensor data from several U.S. and European satellites, researchers from the University of Delaware, NASA's Jet Propulsion Laboratory and the Ocean University of China have developed a method to detect super-salty, submerged eddies called "Meddies" that occur in the Atlantic Ocean off Spain and Portugal at depths of more than a half mile. These warm, deep-water whirlpools, part of the ocean's complex circulatory system, help drive the ocean currents that moderate Earth's climate. The research marks the first time scientists have been able to detect phenomena so deep in the ocean from space--and using a new multi-sensor technique that can track changes in ocean salinity. The lead author of the study was Xiao-Hai Yan, Mary A. S. Lighthipe Professor of Marine Studies at the University of Delaware and co-director of UD's Center for Remote Sensing. His collaborators included Young-Heon Jo, a postdoctoral researcher in the UD College of Marine Studies, W. Timothy Liu from NASA's Jet Propulsion Laboratory in Pasadena, Calif., and Ming-Xia He, from the Ocean Remote Sensing Institute at the Ocean University of China in Qingdao, China. Their results are reported in the April issue of the American Meteorological Society's Journal of Physical Oceanography. "Since Meddies play a significant role in carrying salty water from the Mediterranean Sea into the Atlantic, new knowledge about their trajectories, transport, and life histories is important to the understanding of their mixing and interaction with North Atlantic water," Yan notes. "Ultimately, we hope this information will lead to a better understanding of their impact on global ocean circulation and global climate change." First identified in 1978, Meddies are so named because they are eddies--rotating pools of water--that flow out of the Mediterranean Sea. A typical Meddy averages about 2,000 feet (600 meters) deep and 60 miles (100 kilometers) in diameter, and contains more than a billion tons (1,000 billion kilograms) of salt. Coupling data collected by several different satellite-borne sensors, researchers from the University of Delaware, NASA's Jet Propulsion Laboratory, and the Ocean University of China have been able to "break through" the ocean's surface to detect "Meddies" -- super-salty warm-water eddies that originate in the Mediterranean Sea and then sink more than a half-mile underwater in the Atlantic Ocean. The Meddies are shown in red in this scientific figure. While warm water ordinarily resides at the ocean's surface, the warm water flowing out of the Mediterranean Sea has such a high salt concentration that when it enters the Atlantic Ocean at the Strait of Gibraltar, it sinks to depths of more than a half mile (1,000 meters) along the continental shelf. This underwater river then separates into clockwise-flowing Meddies that may continue to spin westward for more than two years, often coalescing with other Meddies to form giant, salty whirlpools that may stretch for hundreds of miles. "Since the Mediterranean Sea is much saltier than the Atlantic Ocean, the Meddies constantly add salt to the Atlantic," Yan says. Without this steady salt-shaker effect, he notes, the conveyor belt of ocean currents that help distribute heat from the tropics toward the North Pole might be diminished, resulting in colder temperatures in regions such as New England and northwestern Europe that currently experience more temperate climates. "There is concern about global climate change shutting down the ocean currents that warm the Atlantic Ocean," Yan says. "The melting of sea ice at the North Pole could add enormous amounts of fresh water to the Atlantic, reducing its salinity enough to slow the sinking of cooler water, which would shut down the conveyor belt of ocean currents that help warm major regions of the planet." Yan and his team drew on data from several satellite sensors that can read an important signal of a Meddy's presence. 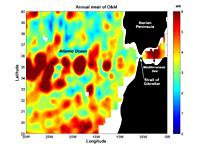 Altimeters flying aboard NASA's Topex/Poseidon and Jason satellites and the European Space Agency's European Remote Sensing and Environment (Envisat) satellites measured the height of the sea surface compared to average sea level, revealing the difference in altitude where a Meddy entered the Atlantic. 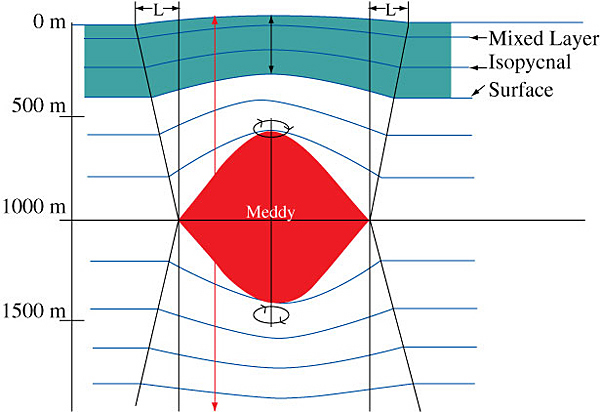 This figure shows the shape and location of a deep-ocean whirlpool, or "Meddy," more than 500 meters below the ocean surface. Specialized microwave radars called scatterometers, including the former NASA Scatterometer (NSCAT) on Japan's Midori-1 spacecraft and the current SeaWinds instrument on NASA's QuikSCAT spacecraft, measured the surface wind over the ocean, providing data needed to remove the surface variability "noise" caused by the wind blowing over the ocean's surface. The scientists also analyzed data provided by an infrared spectrometer known as the Advanced Very High Resolution Radiometer, which flies aboard National Oceanic and Atmospheric Administration satellites. This instrument maps the heat emitted by the ocean's top layer and showed the increase in temperature from a warm Meddy before it began sinking beneath the waves. "By carefully removing the stronger surface signatures of upper ocean processes, we were able to unveil the surface signatures of deeper ocean processes, such as the Meddies, to these space-based sensors," Liu explains. While the technique is not yet 100 percent accurate, Yan and his colleagues are continuing to refine it and are exploring its application to other coastal regions of the world. They are currently examining salinity variations in the East China Sea before and after the Three Gorges Dam--the largest dam in the world--was built. The data will help researchers assess the dam's impacts on the ecosystem and on water circulation patterns. The research was supported by grants from the National Aeronautics and Space Administration, the Office of Naval Research and the National Oceanic and Atmospheric Administration.